The Nissan Altima, which is not particularly well-known and not always well-loved, is offering nothing new for 2015. Or almost nothing. With new models and new features capturing all the headlines, it’s easy to overlook this mid-size sedan. But Nissan Canada isn’t asleep at the wheel on this one. In an effort to create some buzz around the Altima (and the Rogue, which we’ll discuss in a separate article) they invited a few automotive journalists to test it—on Route 66. As a major highway connecting Chicago to Los Angeles, Route 66 was especially popular in the 30s, 40s and 50s. In 1956, the Eisenhower administration expanded the country’s highway network, a move that relegated Route 66 to the background. Today, it’s something of a cult classic. The road penetrates the heart of America, with all of its excesses, contradictions, challenges and delights. We covered a heckuva lot of ground in the Altima. It was nothing like a regular test drive, where a car’s capabilities are measured in controlled environments. This trial was more like a road trip, where it’s not about getting to your destination so much as enjoying the journey. We stuck to the speed limit and took in the amazing scenery along the way. I admit that I was a little hesitant about driving for so many kilometres. My back and delicate derrière are becoming less tolerant with age. Fortunately, Nissan joined forces with NASA to create Zero Gravity seats (for real, people!). These seats are exceptionally comfortable for the category. Even after spending more than 10 hours inside the car, my well-padded body had no complaints. But then again, maybe it’s also because I spent the day with some lady colleagues who were equal parts pretty and pleasant. One thing I would have liked is a little more cool air from the A/C. In the southern U.S. (New Mexico, Arizona and California), the mercury rose past the 30°C mark, and I would have liked to push the temperature in the car down to 18°C. Maybe even 16°C. But to no avail. And this got me wondering whether the opposite problem would occur in winter. Would there be enough heating? In the past, I have driven an Altima in frigid February temperatures, and I never noticed a problem. There were enough storage spaces, at least for two people and their accompanying cell phones, iPods, granola bars, books on Route 66, water bottles, packs of gum, sets of keys, apples, etc. The trunk itself is massive and had no trouble accommodating two suitcases, two travel bags and two backpacks. But Yohan, the cameraman and photographer hired by Nissan to immortalize our trip, preferred the Rogue over the Alima for carrying all his equipment. 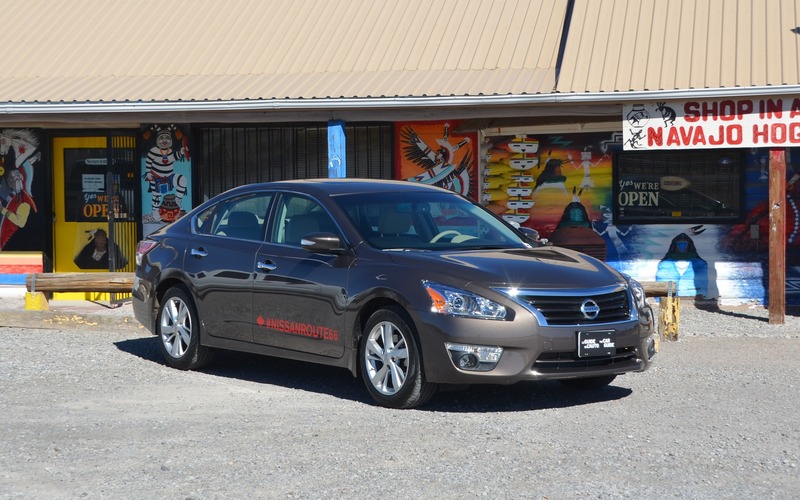 The Altima’s cabin is extremely quiet (except during spirited acceleration). The Bose sound system and GPS were our best friends (without the latter, we might still be stuck in the Arizona desert). The 182-hp 2.5L four-cylinder engine may not be super powerful, but it does the job well enough. Even on steep climbs, it pulls you through. The CVT is what suffers most—and what makes you suffer along with it. Even though I found it worked better in the Altima than in the Rogue, I nonetheless noticed a certain elastic-y feeling during gentler acceleration, as though the transmission needed a little time to find the right position. That said, most Altima drivers will probably think it’s just fine. Most people are unaware that cars even have transmissions, anyway. Since we generally drove at the speed limit and refrained from accelerating too abruptly, we obtained an impressive average fuel consumption of 6.2 L/100 km one day and 6.3 the next. Consumers are going to notice the fuel savings a lot more than the transmission! During our journey, I almost forgot that the steering lacks dynamism and offers too little feedback. Meanwhile, even though the brakes are not particularly memorable, they did, in one instance, save our lives. As we entered a construction zone, the truck and trailer in front of us started to slide, until the trailer hit the guardrail. We were saved by my colleague’s driving skills and the vehicle’s brakes. The Altima isn’t a spicy car. It’s not as saucy as a Mazda6 or even a Honda Accord or Ford Fusion. But after spending 10-odd hours inside one, I learned to love the Altima for what it is: an unpretentious, fuel efficient, reliable and comfortable machine. And that’s pretty impressive! 6/10	Its design won’t make the headlines. 9/10	The Zero Gravity seats are really impressive. 6/10	If you buy an Altima for its performance, prepare to be disappointed! 8/10	If you regularly spend hours at the wheel, the Altima is a good choice.